The EPA estimates sand replenishment and seawall construction to protect Long Beach Island from a possible 1-3 foot sea level rise in the coming century could total between $100- $500 million. Beaches and marshes on the Atlantic coast are vital stop-overs to several species of migratory birds and some sea turtles. They require the habitat for mating, nesting, and food. With houses, roads, and sea walls in the way, these habitats will slowly diminish until they disappear entirely or become too degraded to support the diversity they currently have. The Federal Emergency Management Agency (FEMA) estimates that a 1-foot rise in sea level could increase flood insurance premiums in New Jersey by 35-60 percent. Juxtaposed with the heavy development of Seaside, NJ. 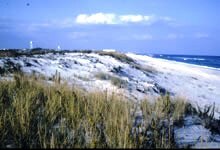 Note how the dune habitat differs between the natural habitat and the developed. Erosion and sea-level rise are increasingly serious issues to coastal communities like this one. After nor'easters in Fall 2009 and March 2010, the bike path along Plumb Beach experienced severe erosion. It has since been moved further from the shoreline. The impact of storms like this will worsen as sea level rises. As seen by the orthophoto, the beach is set alongside a portion of the Belt Parkway. The erosion of the beach now threatens the Parkwaym which is considered a major emergency route for NYC. By the end of the year, the Army Corps of Engineers hopes to begin implementing structures (two groins and one breakwater) to reduce wave energy and build up sediment in the area nearest the Belt Parkway.